It is not the singular form that stands in focus of Rudolf Steiner’s sculptural work, but his models, which visualize the continuity of the first and second Goetheanum Buildings encouraging creativity. They enable us to enter into processual thinking and embark on creative work. They open up an imaginative space, allowing for experiment and investigation. 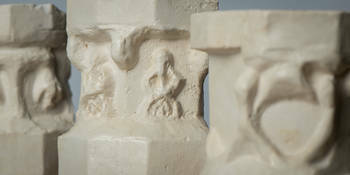 Sculpting, working with clay, drawing, especially the use of a variety of methods and materials, pave the way for perception and dialogue and encourage research and discoveries.